Library image #1949: A view of Wilson Peak through the Aspens in the San Juan Mountains. The United States Congress designated the Lizard Head Wilderness (map) in 1980 and it now has a total of 41,525 acres. All of this wilderness is located in Colorado and is managed by the Forest Service. Lizard Head Peak (13,113 feet), stands spire-like on the eastern side of the Lizard Head Wilderness shadowed by 14,000-foot peaks, Mount Wilson and Wilson Peak. Not far to the west, you'll find El Diente (or the tooth, in English), the westernmost of the state's "fourteeners". The province of more experienced climbers, Mount Wilson and El Diente are connected by a famous knife-edged ridge and considered difficult ascents. The summit of Lizard Head Peak, a 400-foot-tall tower of rotten rock, has been voted as one of Colorado's most dangerous and difficult climbs. Dolores Peak (13,290 feet) stands in the most western portion of the Wilderness. On a clear day you can stand in snow on any of the area's high peaks and see the red rock canyon lands of southern Utah to the west. 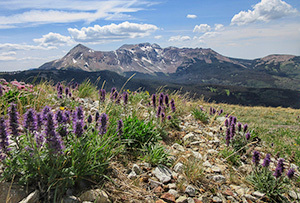 Lizard Head Wilderness is a land of ragged mountain splendor, with lovely cirque lakes, swift mountain streams that often plunge over dramatic waterfalls, and a spruce-fir forest opened by expanses of alpine vegetation. Magnificent golden aspen blanket the lower slopes in vast unbroken reaches every fall. Human use is moderate to light on the 37 miles of trails. Planning to Visit the Lizard Head Wilderness? How to follow the seven standard Leave No Trace principles differs in different parts of the country (desert vs. Rocky Mountains). Click on any of the principles listed below to learn more about how they apply in the Lizard Head Wilderness.